A Roma settlment in Kralovsky Chlmec, Slovakia, March 2015. Petr David Josek / Press Association. All rights reserved.On April 1, Slovak Interior Ministry investigators stopped prosecutions in all cases against police officers and announced that there was no torture, no illegal entry into homes and no inappropriate coercion during a notoriously violent police raid in the Roma settlement of Budulovská in the town of Moldava nad Bodvou in Moldava back in June 2013. In a public statement the ERRC and the Centre for Civil and Human Rights (Poradňa) described the investigation as wholly ineffective and condemned the decision not to prosecute any of the 60 police officers involved in the raid which left several people injured and in need of medical attention, and caused widespread damage to property and belongings. Some of those detained in police custody afterwards claimed that they were subjected to brutal ill treatment by police officers. The raid attracted much international condemnation; and the foot-dragging, irregularities and delays in the subsequent investigation were widely criticized. The prosecution only started half a year after the raid took place and then it took another year and a half for the investigator to gather all testimonies and evidence before publishing the decision. At one point, in an attempt to discredit the plaintiffs, the investigator requested an expert inquiry into the mental conditions of the victims.At one point, in an attempt to discredit the plaintiffs, the investigator requested an expert inquiry into the mental conditions of the victims. The ERRC earlier reported that state authorities – the Parliament and the Government - refused to examine the Ombudsperson’s report or hear her personal intervention. Instead, the Prime Minister and the Minister of Foreign Affairs charged her with breaking the existing law, and the Ministry of Interior reacted with labeling her “a liar, who unfortunately politicizes the issue”. “The conduct and the outcome of this investigation suggest that Slovak law enforcement officers operate in a climate of complete impunity. There is an urgent need for an independent police complaints commission with a remit to ensure that justice is served, in a prompt, timely and transparent fashion,” stated Jovanović. The decision not to prosecute any police officers came as little surprise and is entirely consistent with a recent verdict of the United Nations Committee against Torture (CAT) that systematic repressive action by the police goes hand in hand with ineffective investigations of police misconduct. 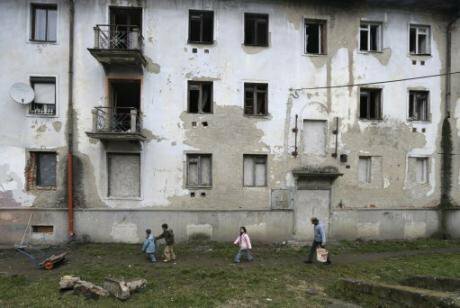 When it comes to residential segregation, in a country where 14 walls and barriers were erected in the last couple of years to separate Roma from the rest of society, a recent survey confirmed that things are getting worse. Greater numbers of Roma live in poor and segregated settlements in substandard housing, unprotected from environmental hazards that include toxic industrial waste, rubbish tips, seasonal flooding, and the intermingling of waste and drinking water. In January five children died, one froze to death and four died in fires in such shocking conditions. In a public statement following these tragedies, ERRC President Đorđe Jovanović described these small children as “the fatal casualties of more than two decades of discriminatory neglect in housing policies for marginalised Roma communities.”When it comes to racial segregation and discrimination, Slovakia has become Europe’s own ‘Deep South’. The recent general election successes of the neo-Nazi party "Kotleba - People's Party Our Slovakia" (LSNS) sent shock waves across Slovakia. More than 200,000 voters cast ballots for LSNS, giving it 8 % of the vote and 14 seats in Parliament. This should not have come as a surprise, for this is what happens when mainstream parties embrace racist and populist agendas. This should not have come as a surprise, for this is what happens when mainstream parties embrace racist and populist agendas. While the European Union ponders what action to take against the governments of Poland and Hungary for their transgressions, it should pay closer heed to happenings in Slovakia as it continues to fall short of ‘Council of Europe standards’ in a seemingly inexorable shift to the dark side of democracy: illiberal, majoritarian, Christian and national. April 8 marked International Roma Day and European institutions lined up to signal their recognition of the place of Romani people in society, and the need for more inclusion. This recognition is welcome, but it would be more useful to hear from these institutions what it’s going to take to deliver basic justice beyond racism in 21st century Europe.